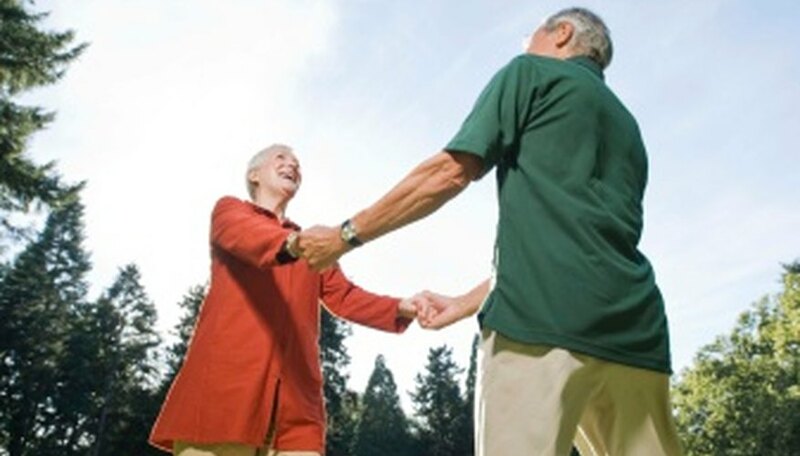 Like people of all ages, senior citizens look forward to time spent outdoors, and a picnic offers a classic venue for fellowship, food and games. While most seniors aren’t up for the vigorous picnic games of their youth, such as volleyball or softball, they can enjoy dozens of other games. Some provide physical activity while others simply facilitate casual, entertaining time with friends and family. Games that utilize tossing skills are popular with mobile seniors and can easily be modified to accommodate people confined to wheelchairs. Set up a horseshoe set--preferably a lightweight plastic version--in an easily accessible area outdoors. A simpler tossing game consists of using beanbags to toss through a cut-out hole in a box, or another target, such as a hula hoop resting on the ground. Also consider making a ring toss game from a weighted-down bottle or peg and plastic or rope rings. Senior citizens often enjoy competing with their friends. Measure off a certain length of lawn or driveway and use a stopwatch to conduct simple walking races. If dexterity isn't an issue, up the ante by having each participant carry an egg in a spoon as they walk. For the wheelchair-bound, play a few rounds of wheelchair races along the same track. Or provide each seated participant with an old-fashioned wooden cup-and-ball set and have them race to see who catches the most balls in their cups in a set time frame. While many people enjoy bowling throughout their adulthood, some seniors have to give it up because they can no longer lift heavy bowling balls. So purchase a lightweight, plastic bowling set, then mark off a lawn or patio bowling lane on a flat paved area or on an even stretch of short grass. Set up the pins and score the game in the traditional manner. Many seniors in wheelchairs enjoy enough mobility to participate in lawn bowling as long as the ball is lightweight and rolls easily across the ground. Select a comfortable, shady area and set up a card and board game corner so that the less-mobile senior citizens within the group can also enjoy the fun of competition. Set up tables with board games such as checkers, dominoes, chess or Scrabble. Put up another card table or two, topped with decks of cards and a book or printed sheet of instructions for various card games, including old favorites such as canasta, gin rummy, pinochle and spades.